Sale on leather biker chaps, save on mens and womens leather biker chaps. Low prices on leather chaps, Motorcycle Gear Superstore. Largest selection of men's and women's leather chaps for riding motorcycles, at the lowest prices available. 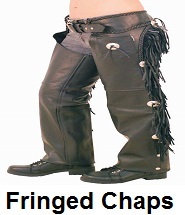 Biker chaps come in many different styles, most bikers prefer to wear leather chaps. Other motorcycle riders may choose to wear chaps that are not made from denim. The type of chaps you select, should fit the type of motorcycle riding you will be doing. we offer all types of leather biker chaps. The choice made by bikers to wear a leather motorcycle chaps, is done for safety reasons. 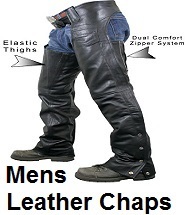 Leather motorcycle chaps provide the best protection for bikers in case of an accident. 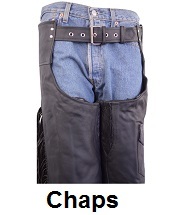 Chaps made from leather are durable and can help protect a biker from getting foot injuries during a crash. The best protection a biker can get, is by wearing chaps that are made from durable leather. We sell top grade quality leather motorcycle chaps at unbeatable prices. Shop and save on leather biker chaps, Free shipping on all leather biker chaps that meet the minimum price guarantee. 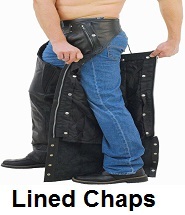 The most popular type of biker chaps are leather chaps. 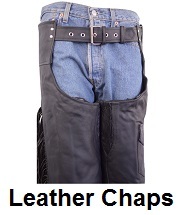 Biker chaps made from leather, are worn by motorcycle riders to help protect their legs while riding. Leather Biker chaps will keep a bikers legs from getting cuts, scrapes and bruises during a crash. Leather chaps are needed for motorcycle riding. Leather chaps will help keep a biker legs warm on a cool day. Not to mention, leather chaps will help protect your legs from flying debris while riding your motorcycle. Wearing a good pair of leather chaps for motorcycle riding is important and should be considered when picking out all your motorcycle apparel or clothing. We offer all types of leather biker chaps. 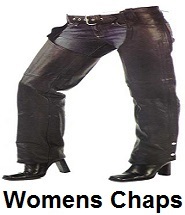 Shop and save on men's and women's leather biker chaps. How to select the right pair of leather biker chaps for motorcycle riding. Most bikers prefer plain leather chaps for motorcycle riding, other bikers may want leather chaps that have fringe on them. The style of leather chaps you wear is a personal preference and there is no right or wrong choice in whatever style of leather chaps you choose. The main thing is to wear a pair of leather chaps that fits your style. All our leather biker chaps, come with a 30 day unconditional return policy. Just return any leather biker chaps, within 30 days and we will grant a full refund.